A small, ethnic restaurant situated in one of the ‘food markets’ of Gurgaon—Baani Square—Motuu’s Qila has quite a following for their Sindhi food. Bhugal Gosht, a traditional cardamom-based curry, often made with goat meat. At Motuu’s they use lamb, which is cooked perfectly, the gravy is rich and has a strong cardamom flavour with soft notes of clove. It is oily and has quite a strong flavour, but is absolutely ravishing for those who don’t mind the spice. 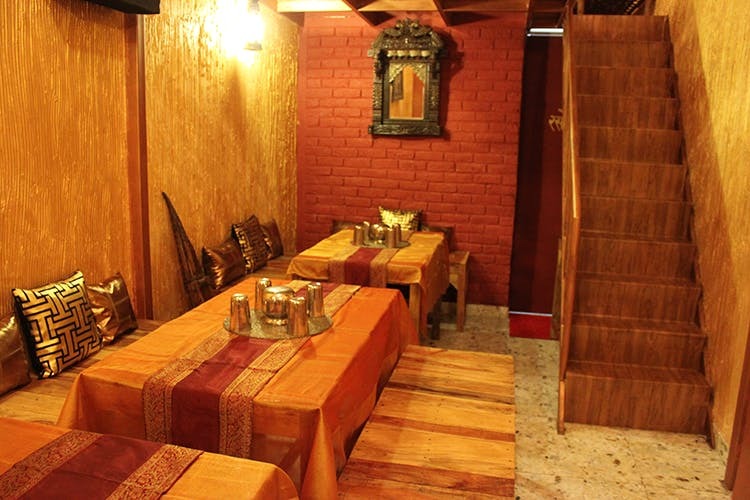 The prices are extremely nominal and all dishes are served with rice or roti, making it a complete meal. The cuisine is the native cuisine of Sindhi people from the Sindh region, Pakistan. A typical Sindhi meal consists of a phulka, rice, one gravy and one dry dish. The cuisine is majorly influenced by the region you eat it in and that is evident by the kind of meat used; chicken and lamb is used in India and beef in Pakistan. The beauty of this cuisine lies in its simplicity, and its focus on limited spices imparting their full flavour, making the dish taste deceptively complex. The delivery takes forever, so it’s best to eat at the restaurant. The quality of rice can definitely be improved, we felt. The ambience is wooden-rustic, adorned with a bicycle, wrought iron pieces, and khatiyas giving it a village-like atmosphere. Do not miss the pickled onions and ginger served along with the meal. It is not only delicious but also acts as a digestive.